This month, this week, this year marks 9 years on this amazing journey of therapy and healing. This is my place of healing, the room that holds the story, the pain, the joy, the truth of so many things I kept hidden inside me for 30+ years. 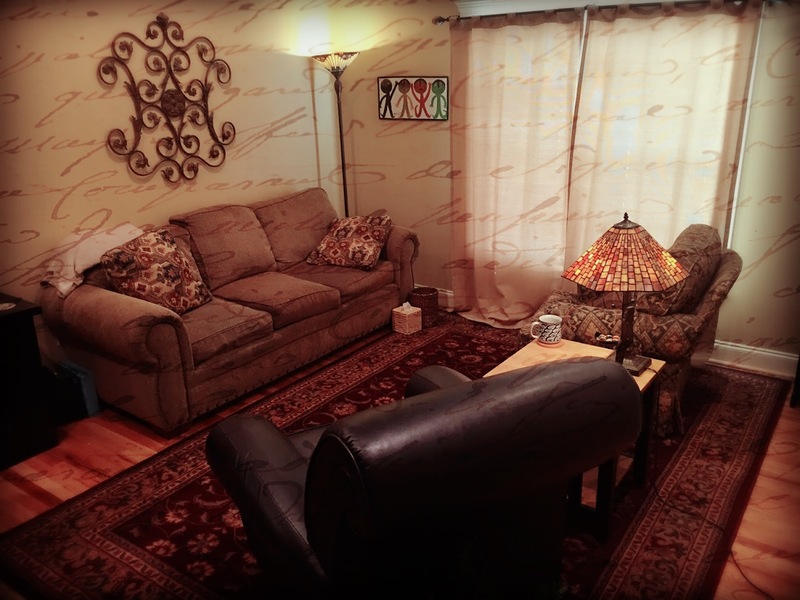 This is a photo of my therapy room, the room I stepped into 9 years ago and began my healing journey with an amazing therapist who has guided me into the life I never thought I could live. 9 years ago I began this journey with one foot out the door out of fear, and today I claim this room as the place of my healing and the place that has changed my life, and has healed so many open wounds. I have sat in every chair in this room – made my way around the room in anger, tears, laughter, joy, excitement and many other feelings and emotions that I have had through the years! The room [ . . . . . ] has seen and heard it all. This room is where I feel the most open, and this room holds so many secrets that I had to hold onto for so long! I feel such comfort in this room, and it took a long time to finally find a place I could trust. This past week my therapist and I talked about our 9 year journey thus far, and we talked in awe of how far we have come, and the journey we have taken together, and the work we look forward to as I continue to take steps into my healing path. I couldn’t be any more blessed to have an amazing therapist who I trust with every being in my soul. He has helped me take one brick out at a time from the walls that were built so high around me 9 years ago, and today the only part of the wall that remains are the small bricks I take out, and put back when needed as I work through different levels of healing. 9 years ago I walked into this room not knowing what the journey held ahead. Not knowing how long this journey would take, or the painful work it would take to remove each brick from the wall as I talked about my past, my story and the painful truth I held onto for so long. 9 years ago I walked into this room and met my amazing therapist Andy who has helped, guided, supported, loved and cared for me, my story, my truth and the wounds that I exposed. I never knew how much work, how much pain it would be to walk this journey of healing. But I also didn’t know about the healing and the joy that would come from it. It has been quite a journey. I thought 9 years ago that I would go to this therapist and talk about my past – he would tell me what I needed to do – give me some tips to help me move through my every day struggles – work through those struggles – and I would be healed! – – – – Not even close! Never did I realize or imagine that I would be sitting here 9 years later writing about how much therapy has changed my life, and how much work I have done to emerge from the past and pain I went through my whole childhood. I never imagined I would be sitting here 9 years later feeling and being a completely different person than I was when I began. When I was 5 years old, I would sit in the closet for hours and hours and pray to God that I would have someone to talk to about the pain and abuse I was going through, and how scared I was! It took 30+ years later, but God still showed up in that prayer, and created this healing path before me. In these 9 years I have learned so much about myself, and why I go through the things I go through. I have learned so much of why certain things create in me anxiety and fear, and what story is behind those fears. I understand so much more of what I go through on an every day basis and why – answers I never had my whole life up until now. The one thing that I have learned the most on this journey is, your story needs to be told many different times, not just one time. you need to tell your story as many times as It takes. I have revisited my past and my story many different times from many different levels of healing, and each time I learn something new, and heal a different way. It’s a process, and each process and step is different, and so important. What I talked about 3 years ago, 4 years ago, or even 8 years ago may not have the same understanding as it does now. Healing is truly a process. There were hard times on this journey as well. There were times I wanted to quit and give up because of how hard and painful it was. My work with my therapist has had its challenges over the years, but he never gave up on me, and I never gave up on him and our work. I am truly blessed for this journey that continues, and for my wonderful therapist who I look up to admire. I have also learned that, healing is a process, not a time-table. I don’t look at “when this journey will end in therapy” – I look at where it has taken me thus far as I take new steps into my life in ways I have never lived before, and how therapy and the process has helped me with that. I have gone through some really really hard times the past couple of years to where I almost built the brick wall back up around me out of fear – but my therapist and I have really worked hard on not letting that happen, and continue working hard to build trust and connection – not a wall. So my path continues . . . . I continue to grow, and learn, and yes even have times that I still unfold pain that comes at different levels of healing.. but I embrace it now knowing it continues to take me in the very places I need to be in – painful and hard at times, but so much hope on the other side of that. Thank you for taking this journey with me thus far as I continue to take steps on the path God has put in front of me. I love the connections I have made with others, helping others to see you are not alone on this journey – your voice matters, your healing matters! I am on a journey, a journey to healing! You are on a fine journey to healing; and appreciate your sharing it with your friends…may God continue to be with you on this journey! thank you Barbara and I so appriciate your friendship and support! I’m so proud of you my friend, for taking those terrifying steps 9 years ago. Look at what God has done in your life! And there is more to come. You are such a testimony of how a shattered and broken life can become whole.I’m so thankful you share your story. Blessings! awwww thank you so much Barbie.. you have no idea how much your thoughts touched me this morning …. you are a blessing as well … and I am so glad that we have connected over the past couple of years :) thank you again for hosting my story :) ….. So glad you have shown up in all our lives, Karen. I admire the emotional intimacy you’ve achieved with this therapist. Telling the story again and again is so helpful. Its nature alters, at least it does for me. A puzzle piece shows up, like a seed, another piece arrives days, months or years later, another hours later, another years later… the story alters each time. Or maybe I am altering. I resonate with that 5-year old you mention, who prayed that someone charitable would show up. How I prayed for someone kind to show up, too! BTW, I like this clean layout. Interesting how your blog morphs. Karen, you are one beautiful courageous woman! I just discovered your blog and I am in awe of your honesty an vulnerability. Keep it going. May god give you continued strength to becoming a better version of the person you want to be every day. And I hope you continue sharing that journey as it happens.